A good number of you emailed after seeing the profile of me in the May issue of Whole Living Magazine. Crazy, right? It ended up being eight pages(! ), and highlighted a bunch of recipes from Super Natural Every Day. I thought I'd tell you a bit about how it came together, and share a few behind-the-scenes shots. On the recipe front, I'm tacking on a recipe for a Farro & Millet Risotto I've been making quite a bit lately as we try to close the door on winter this year - the weather hasn't entirely cooperated. You can use whatever fresh or roasted vegetables you like - asparagus, peas, and herbs are great this time of year. But I was making it with roasted delicata or other little squashes until recently. So - Whole Living. The story was shot by John Kernick, who I've admired from a far for a long time. He shot a lot of memorable feature articles for Gourmet Magazine that I'm sure you remember. So, thank you John and Darrell, and Jamie, and lovely Lucy. And Lindsay for the article itself. And Rachel, and Maria, and Erika, and Dawn, and Sari, and Alex. Its not everyday one gets to be featured in one of their favorite magazines. Today's risotto is winter/spring adaptation, and distant cousin, of the Zucchini and Millet Risotto in the Rose Bakery cookbook - which we've been cooking from quite a bit over the past couple of months. It hadn't occurred to me to use millet in risotto until I tried it here, but it actually lends a nice creamy, porridge-like texture. I use farro or barley instead of rice as the base, and trick it out with whatever looks good at the market. You can do lots of fun things with the leftovers as well - fashion the day-after, cold risotto into arancini and pan-fry them. I even thin leftovers out with broth, add some beans and greens and make a soup of it. Give it a try! Other news: I hope to see some of you in Portland and Seattle this weekend! It's going to be a whirlwind, and I'll be there for a handful of signings. Kim Boyce and I will be at The Cleaners @ The Ace Hotel on Friday night. I'll also be signing/selling books at The Remodelista Local Seattle Market on Saturday, April 30th, from 11am to 4pm. And later that evening alongside Lara Ferroni at Spare Room. Detailed info about each event is also here. HS: I used farro here, but you can certainly swap in pearl barley as an alternative. 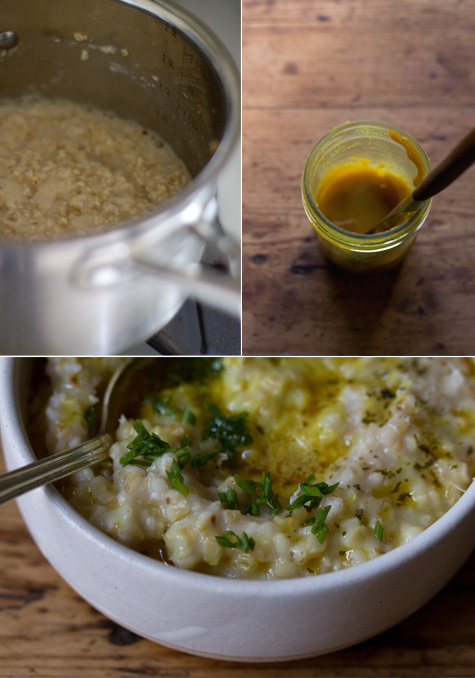 Add-ins: When delicata squash as still in season - I cube and roast it to top this risotto. In the photo above you'll also see I used some chopped chives and a generous drizzle of curried brown butter made from simply adding a bit of curry powder to a skillet of butter I'd browned over medium heat. But now that we are smack in the middle of spring, I've been trading out the squash for chopped asparagus and whole peas - adding them to the pot in the last few minutes. It works best to cook the millet and farro separately here. Start by adding the millet to a small thick-bottomed saucepan over medium heat. Toast it, stirring constantly, until the millet is golden and fragrant - just a few minutes. Add 1 3/4 cup / 475 ml water, 1 tablespoon of the oil, and a couple generous pinches of salt. Stir, bring to a simmer, cover, and cook for about 20 minutes, or until the grains are cooked and free of liquid. Taste, and if they need more time, cook for a few minutes more, then remove from heat, and leave covered for another 5-10 minutes. Fluff with a fork, and set aside. In the meantime, get the farro started in a separate large pot over medium-high heat. Stir in the remaining oil, butter, onions and a big pinch of salt. Cook until the onions are soft and translucent. Stir in the garlic, and cook for a couple minutes more. Add the farro and cook for a couple minutes before adding 2 cups of the broth. Cook, stirring, until the farro has absorbed most of the liquid before adding another cup. Keep adding stock in increments like this until the farro is cooked through - it takes some time. Once it's cooked, stir in half the millet. Add more broth if needed, the risotto should be loose. Decide whether or not you want to add the remaining millet - it's a personal preference really. The millet makes the risotto take on a more porridge-like texture. Now stir in most of the Parmesan. Taste, and adjust the seasoning. Add more broth if needed - again, you want the texture to be loose and creamy. A spoon should not be able to stand up straight in the risotto. It's a big day for me, my new cookbook is being published. I always forget how long it takes! I've written quite a bit about the process along the way. To that end, I thought it might be helpful to wrangle all the Super Natural Every Day info into one round-up post.